From grapevines to hops, Austin serves up a bevy of local, craft libations sure to please every palate. Whether you&apos;re a sommelier or a beer aficionado, there&apos;s a place to find your drink in Austin. Texas wine may sound like a fable, but in Austin, it&apos;s reality. With more than 30 wineries within a short drive, the Austin area is a perfect spot to uncork a bottle, sip award-winning wines and take in the Hill Country. Stop in Fredericksburg and taste crisp chardonnays and bold merlots at more than a dozen local wineries. Kick back at Woodrose Winery & Retreat and enjoy a glass of wine under the oaks. Closer to home you&apos;ll find an array of wine bars sprinkled throughout Austin. Munch on cheese plates paired with international wine selections in the outdoor lounge at House Wine. Brew fans revel in Austin&apos;s booming craft beer scene. 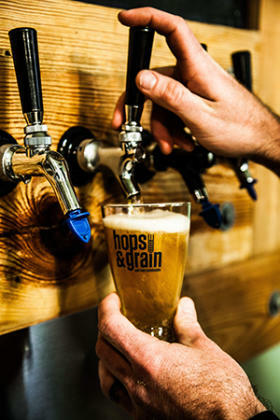 Tour the brewery at Hops & Grain, and taste exclusive samples not available anywhere else. Sample all or one of Austin Beerworks&apos; core four beers, offering crisp, bold refreshment year-round. At Adelbert&apos;s Brewery, savor a wide selection of hand-crafted Belgian-style ales. Craft wine, beer and specialty beverages are served throughout the Austin region. Pair mouthwatering barbecue with smooth wine varieties at Salt Lick Cellars, a local winery just outside the Austin city limits. 24 Diner serves up chef-inspired comfort food along with a killer wine and beer list, while Hopfields welcomes beer experts and newbies with 42 brews on tap and classic home-style French food. Head over to Rainey Street and grab a seat at Craft Pride, featuring 54 taps representing over 20 breweries, and a small, yet tasty selection of wines made right in Texas. Be a part of the community at Black Star Co-Op, the world&apos;s first co-operatively owned brewpub, serving house-brewed beer and Texas pub fare. The newest addition to the Austin craft beer scene, Oasis, Texas Brewing Company features a tap room with flavorful beers and stunning views of Hill Country. Discover even more Austin wine bars and breweries on the Austin Insider Blog.